Chelsea return to the Stadium of Light for the second time in a month, this time for League Cup action, after Eden Hazard ran out the Black Cats ragged in a 4-3 win in the Premier League. DATE & TIME: December 17, 2013 at 14:45 EDT; December 17, 2013 at 19:45 GMT; December 17, 2013 at 20:45 WAT; December 17, 2013 at 21:45 CAT; December 17, 2013 at 22:45 EAT; December 18, 2013 at 01:15 IST. VENUE: Stadium Of Light, Sunderland, United Kingdom. TV/STREAMING NEWS: The match will be telecast live on Setanta Sports in Australia, Sky Sport 1/2/8/HD in Austria, SuperSport 3 Africa in African sub-continent, beIN Sport Play in Canada, Al Jazeera Sport HD6 in Egypt, beIN Sport 2 in France, SportDigital in Germany, Ten Action & Ten HD in India, Canal+ Yomvi in Spain, Al Jazeera Sport HD6 in UAE, Sky Sports 1/HD in UK and beIN Sport Play in USA. It is also available online on Sky Go UK in UK and bWIN Live internationally. SUNDERLAND AFC SQUAD NEWS: Sunderland will miss Keiran Westwood and Carlos Cuellar. Jack Colback will miss the game through illness. Predicted Starting XI: Mannone, Dossena, O’Shea, Brown, Celutska, Cattermole, Sung-Yeung, Johnson, Larsson, Giaccherini, Fletcher. CHELSEA FC SQUAD NEWS: Marco van Ginkel and Ryan Bertrand are the only injury concerns. Gary Cahill’s participation is doubtful however. Branislav Ivanovic is suspended after picking up his 5th yellow of the season against Palace. Predicted Starting XI: Schwarzer, Azpilicueta, Luiz, Terry, Cole, Lampard, Mikel, Willian, Oscar, Schuerrle, Ba. THOUGHTS FROM THE ENEMY: Former Chelsea-man Gus Poyet will look to upset Chelsea and expects his team to play for a win. “If we want to get out of the relegation zone, then we have to win matches, become winners. We want to win the cup game for that reason. Let’s hope we can beat Chelsea, then we will be very confident for Norwich. 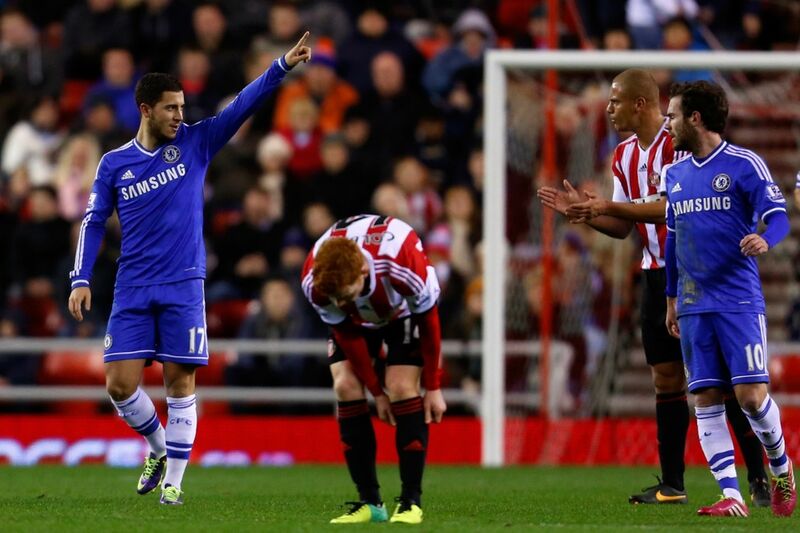 Chelsea have won 17 and lost just one against Sunderland in the last 11 years in all competitions. Chelsea have won their last nine trips to Sunderland in all competitions and are unbeaten in 10 at the Stadium of Light. The only previous League Cup tie between these clubs came in the 1984-85 semi-finals; Sunderland won both legs for an aggregate 5-2 victory. Chelsea have kept three successive League Cup clean sheets, all away from home. Mourinho has never lost a League Cup game as Chelsea manager (excluding penalty shootouts), winning 12 and drawing three of 15. IN A NUTSHELL: Chelsea will look to beat Sunderland and progress to the semi-finals of the League Cup. Mourinho might not start all of the first-team regulars but a strong line-up is expected, considering Chelsea’s bench strength. ChelseaChelsea F.C.Eden HazardGus PoyetPremier LeagueStadium of LightSunderlandSunderland A.F.C. The three strikers need to seek advice from Suarez on how to score goals. He calls this boring soccer offensive. They can’t defend, they can’t score.